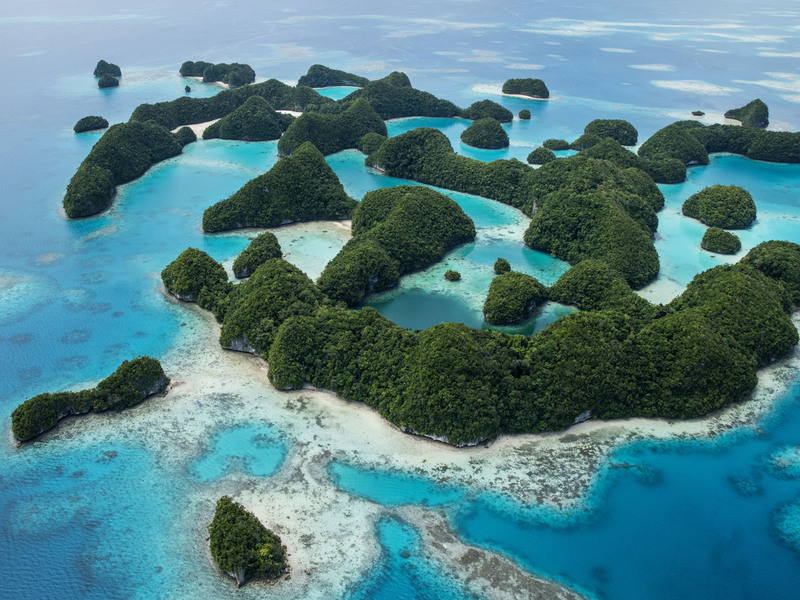 Palau, In Western Pacific, Is First Nation To Ban 'Reef-Toxic' Sunscreens The bio-diverse country says it has a responsibility to conserve its reefs. However, researchers say there are more effective and less toxic sunscreens available. Rock Islands in Palau, a UNESCO World Heritage Site and a popular dive location. Retailers who break the "reef-toxic" sunscreen ban will face fines of $1,000. In a law passed this week, Palau defines the banned "reef-toxic" sunscreens as containing any one of 10 chemicals, including oxybenzone and octinoxate, which are found in the majority of sunscreens sold in the U.S., according to the Consumer Healthcare Products Association. The nation of over 500 islands and around 21,000 people in the Micronesia region of the western Pacific Ocean has in the past taken steps to protect its biodiversity, which greatly contributes to tourism — its main economic driver. "This short but important bill has the potential to make a lasting impact on the environment here," President Tommy E. Remengesau, Jr., wrote in a letter accompanying the legislation. "As more and more people come to visit our pristine paradise with their own eyes, we cannot relinquish our responsibility for these islands." The report recommended that visitors immediately switch to "more biologically friendly" sunscreen products. Kazuo says that Palau will immediately stop importing reef-toxic sunscreen, but that retailers have until 2020, when the law actually goes into effect, to sell their remaining inventory. According to a 2015 study by researchers at the University of Central Florida, oxybenzone poses a hazard to coral reef conservation by sapping coral of nutrients and bleaching it white. "Any small effort to reduce oxybenzone pollution could mean that a coral reef survives a long, hot summer, or that a degraded area recovers," the study's researcher Craig Downs said in a news release. "With the rise in skin cancer rates and the availability of more effective sunscreen actives such as micronized zinc oxide and titanium dioxide," a 2017 study with similar findings notes, "serious doubts about the relative prevention benefit of personal care products containing oxybenzone must be raised." Hawaii passed legislation similar to Palau's earlier this year that goes into effect in 2021. The CHPA called Hawaii's law a severe compromise to the "health, safety and welfare" of the state's residents and tourists. As NPR has previously reported, "There are already thousands of sunscreen products that do not contain oyxbenzone or octinoxate, with more working their way onto the market."